The pancreas is a glandular organ located behind the stomach near the first part of your small intestines. Its role is to secrete enzymes to help you digest food and hormones to help regulate blood sugar. An inflamed pancreas, called pancreatitis, is not able to function normally, affecting your ability to digest food, especially foods high in fat. You should be able to eat potatoes when you have pancreatitis, but not in all its prepared forms. Pancreatitis is either acute or chronic. Acute pancreatitis is most often caused by gallstones or excessive alcohol use. Chronic pancreatitis is mostly caused by chronic alcohol abuse. While acute pancreatitis gets better, chronic pancreatititis does not. When the pancreas is inflamed, the enzymes, which are normally not active until they reach the small intestines, become active in the pancreas and attack and damage the tissue. During an acute attack you cannot eat, so your pancreas can rest, and hospitalization is required for pain control and hydration. A low-fat diet is recommended for the management of chronic pancreatitis. Your pancreas supplies enzymes that help you digest protein, carbohydrate and fat, but the enzyme that digests fat -- known as lipase -- is the one most affected by pancreatitis. Consuming foods high in fat when you have pancreatitis causes abdominal pain and malabsorption. Limiting your daily fat intake to 40 to 60 g a day can help prevent symptoms. Avoiding fried foods, high-fat meats and dairy products and added fats can help you limit your intake. Potatoes are a naturally fat free and healthy addition to your diet. A 5.3-ounce white potato contains 110 calories, 0 g of fat, 0 mg of sodium, 26 g of carbohydrates, 2 g of fiber and 3 g of protein. 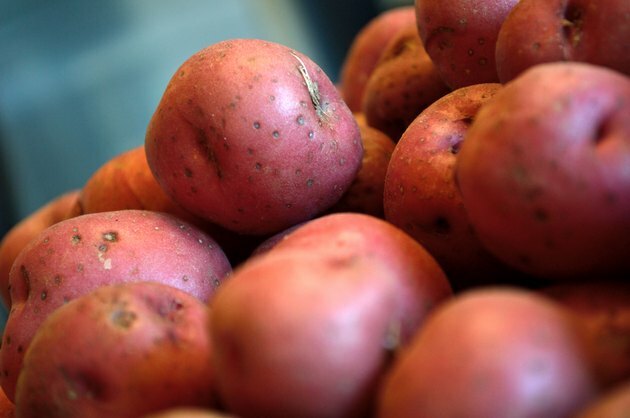 The potato is also a good source of vitamin C, meeting 45 percent of your daily needs. Including more antioxidants, like vitamin C, in your diet plan can help protect you against pancreatitis and alleviate its symptoms. While the plain potato makes a healthy choice when you have pancreatitis, other types of potatoes may not. French fries, for example, contain up to 10 g of fat per serving. Regular potato chips are also high in fat and should be avoided. You may also want to be careful about mashed potatoes and scalloped potatoes. If you like roasted potatoes, try cooking them without any added oil.